Ann Bacher is the Senior Commerical Officer, U.S. and Foreign Commercial Service at the U.S. Embassy in Mexico City, Mexico. I just returned to Mexico City after spending a few days in Minneapolis. I work for the U.S. Dept. of Commerce and am posted to the U.S. Embassy in Mexico City. What would bring me to deep winter from the pleasantly temperate largest city in the world? I was invited to join an all-star cast at the National Export Initiative Conference: New Markets, New Jobs Tour, where over 350 small and medium –sized companies learned how to up their export game. President Obama’s challenge to double exports and create 2 million jobs was highlighted by U.S. Commerce Secretary Gary Locke, U.S. Trade Representative Ron Kirk, Small Business Administration Administrator Karen Mills, Chairman of the Export-Import Bank of the United States Fred Hochberg, U.S. Deputy Secretary of Agriculture Kathleen Merrigan, Governor Mark Dayton and Minneapolis Mayor R.T. Rybak. All I can say is wow—all these export superstars in one place to light a fire under companies to export. Only ONE percent of US companies export –what’s that about? It’s a big world out there –if you have a good product or service –THINK EXPORT! You know your competition is! Mexico is the second largest export market after Canada. Last year we helped over 500 U.S. companies sell into Mexico. You can be number 501! Just go to www.export.gov or www.buyusa.gov/mexico and we’ll see if you’ve got what it takes – I think you do! 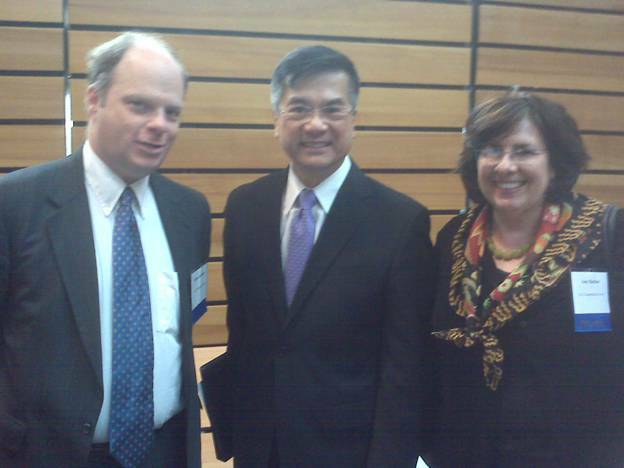 That’s me on the right Ann Bacher with our boss Sec. Locke in the middle and the guy who can help you get into the Canadian market on the left Rich Steffens. Start with the number one and two markets –Canada and Mexico today.